In its 29 years of service, the Hubble Space Telescope has charted galaxies, located far-off exoplanets, and provided breathtakingly precise imagery of our own solar system, and now it looks like it has made one of its most exciting discoveries yet: NASA just revealed that the Hubble telescope has found a $20 bill! NASA made the bombshell announcement at a press conference this morning, where it was revealed that the Hubble Telescope found a perfectly good 20-spot lying in the deep outer reaches of our solar system where anyone could pick it up if they wanted. 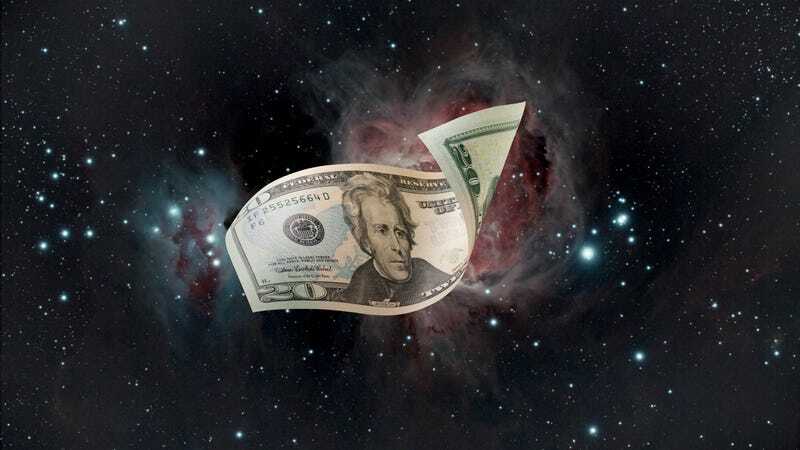 Bearing no visible rips and all the necessary anti-counterfeit features of legitimate currency, NASA expressed confidence that it’s a genuine legal-tender bill, adding that it appears wholly untarnished by the harsh vacuum of outer space. It’s only been a few days since the $20 bill was first identified, but Bridenstine says NASA researchers are already hard at work exploring the scientific implications of the discovery, such as whether there could be additional $20 bills out in space somewhere or perhaps even a $50 bill. He added that, according to early data from the agency’s mathematical forecasting models, there could theoretically be trillions of undiscovered twenties scattered throughout the universe, just lying there for the taking. While Bridenstine noted that this first $20 bill is too deep in the cosmos to be reached by existing spacecraft, NASA will be shifting billions of dollars in research money towards developing new technology that’s capable of doing so, with an ambitious goal of retrieving the money by as soon as 2030. In an era of slashed budgets and waning interest in space exploration, it’s easy to forget that NASA is still making incredible and important discoveries about our universe. But here’s hoping that the discovery of this $20 bill inspires the public imagination and sparks a renewed curiosity in what lies beyond.